On May 16, 1975, Alaska became the second state in the U.S. to decriminalize cannabis. The law imposed a $100 fine for persons possessing cannabis, and became law without the governor’s signature. It passed just a week before the Ravin ruling. Ravin v. State, 537 P.2d 494 (Alaska 1975), was a 1975 decision by the Alaska Supreme Court that held the Alaska Constitution‘s right to privacy protects an adult’s ability to use and possess a small amount of marijuana in the home for personal use. The Alaska Supreme Court thereby became the first—and only—state or federal court to announce a constitutional privacy right that protects some level of marijuana use and possession. In 1982, following the Ravin decision, Alaska’s legislature decriminalized possession of up to 4 ounces of cannabis in the home, or one ounce outside the home. Noy v. State is a case decided by the Alaska Court of Appeals in 2003. David S. Noy was convicted of possessing less than eight ounces of marijuana by a jury. However, in 1975, the Alaska Supreme Court ruled in Ravin v. State that possessing less than four ounces of marijuana in one’s home is protected by the Alaska Constitution‘s privacy clause. The amount possessed being over four ounces was highly in question on appeal. Thus, the Alaska Court of Appeals overturned Noy’s conviction and struck down the part of the law criminalizing possession of less than four ounces of marijuana. The Alaska legislature passed a new law making possession of under one ounce a misdemeanor punishable by up to 90 days in jail. Possession of one to four ounces was made a misdemeanor punishable by up to a year in jail. Possession of over 4 ounces was made a felony. The measure was pushed by governor Frank Murkowski. Alaska Measure 2 was a successful 2014 ballot measure, described as “An Act to tax and regulate the production, sale, and use of marijuana.” The measure went into effect on February 24, 2015, allowing Alaskans age 21 and older to possess up to an ounce of cannabis and six plants, making Alaska the third state to legalize recreational marijuana, following Colorado and Washington. 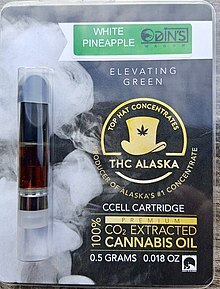 Oregon and Alaska both voted in legalization on Election Day 2014, but Alaska preceded Oregon in enacting their legislation. The state of Alaska collected its first full month of cannabis tax proceeds in November 2016, raising $80,000 for the state; cannabis buds are taxed at $50/oz and stems and leaves at $15/oz. The state reported FY 2017 marijuana tax revenue of $1,745,767 (cultivators only – not retail). In December 2016 and January 2017, widespread supply shortages were reported, causing many cannabis shops to temporarily cease operations until inventory was restored. In January 2017, Anchorage Assemblyman Forrest Dunbar proposed legislation banning cannabis stores from advertising discounts to active-duty military, who are prohibited by federal policy from consuming cannabis. ^ Matthew Lippman (August 22, 2013). Essential Criminal Law. SAGE Publications. pp. 298–. ISBN 978-1-4833-2447-0. ^ “Alaska Court Upholds Privacy Right to Smoke Marijuana in the Home”. Cognitiveliberty.org. September 2, 2003. Retrieved January 30, 2017. ^ Volz, Matt (June 6, 2006). “ACLU sues state on marijuana law”. Juneau Empire. Retrieved February 8, 2018. ^ “Full Initiative Text | Campaign to Regulate Marijuana in Alaska”. Regulatemarijuanainalaska.org. Retrieved April 20, 2015. ^ AP February 24, 2015 (February 24, 2015). “Alaska becomes 3rd state with legal marijuana”. Usatoday.com. Retrieved April 20, 2015. ^ Laurel Andrews (January 3, 2017). “Alaska collects first full month of marijuana tax revenue”. Alaskan Dispatch. ^ Revenue, Alaska Department of. “Alaska Department of Revenue – Tax Division”. tax.alaska.gov. Retrieved October 27, 2017. ^ Laurel Andrews (January 4, 2017). “Legal weed is hard to come by in Alaska”. Alaskan Dispatch. ^ “Alaska Politician Proposes Ban On Marijuana Discounts For Active Military | Weed News”. Weednews.co. January 25, 2017. Retrieved January 30, 2017.